There is a bike picture at the end, I promise. 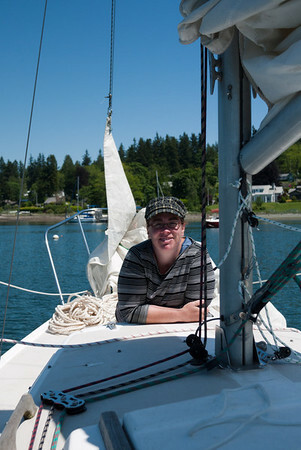 Christine and I took our new sailboat “Lutra” out for it’s first overnight cruise this weekend. 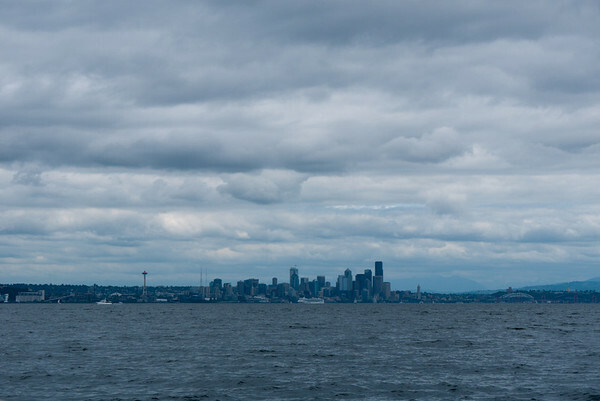 It was also our first time taking the boat onto Puget Sound, normally we just sail on Lake Union and Lake Washington. 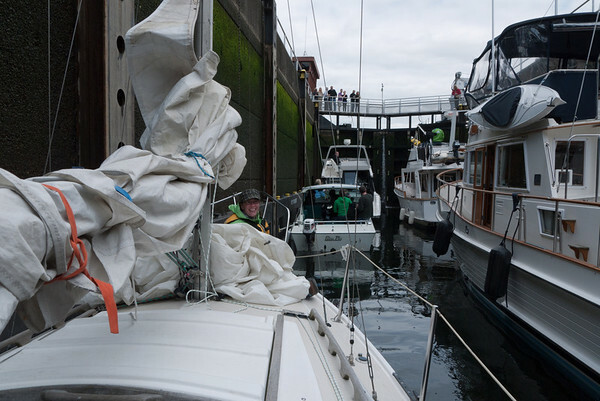 Getting out to the sound requires going through the Ballard Locks. On Saturday morning (way too early in the morning according to Christine) we left from Lake Union, went through the Ballard Locks, and crossed over to Bainbridge Island. We went in circles for a little bit trying to decide which direction to head around the island, and finally decided to head north. One of Christine’s highlights was seeing a small pod of harbor porpoise in this area. 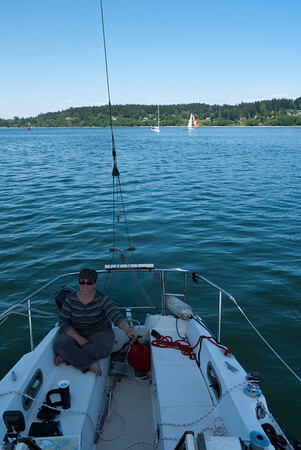 We anchored for a lazy lunch at Port Madison on the north end of the island and waited about 90 minutes for the currents to change, then headed south with a tailwind through Agate Passage (against a small current). The winds were highly variable on the west side of Bainbridge Island and after about 30 minutes of calm turned to come from the south. 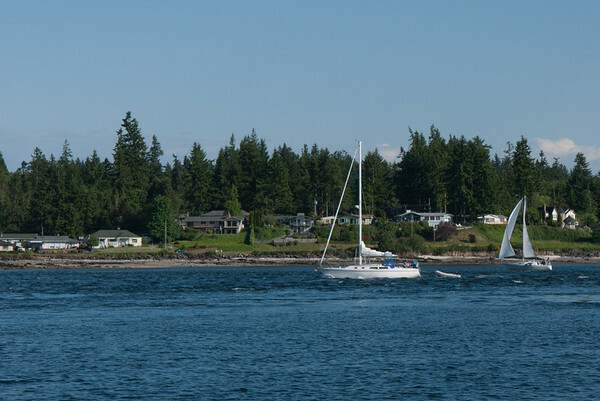 We tacked down the passage between Bainbridge and the mainland and found some much stronger and gustier winds near Bremerton. 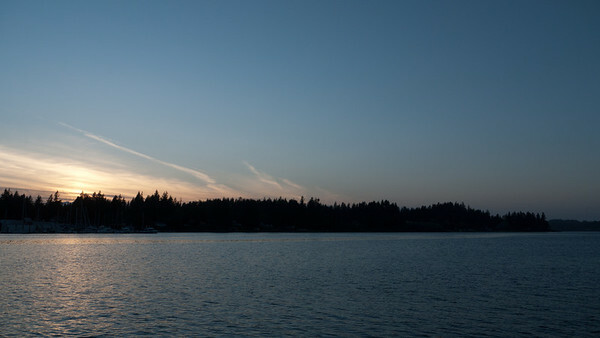 From there we turned north again up the small Dyes Passage and set anchor in Phinney Bay for the night. 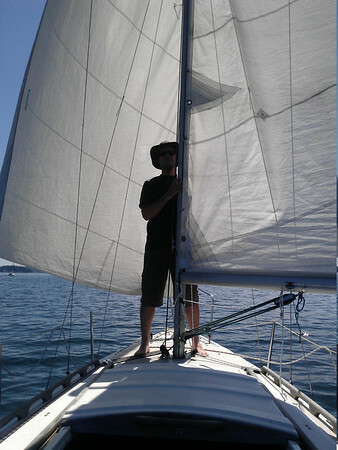 The night was pretty good, but we learned how much an anchored sailboat can move around in a moderate wind. In early morning I woke up and moved us to the better sheltered Ostrich Bay and we slept there for another few hours. I actually slept until 9am, which is way beyond my normal rising time. The boat is pretty comfortable once situated. On Sunday we awoke to grey skies, cooler temps, and higher winds. We started to tack back down Dyes Passage, but progress was slow and gusts were high and coming from different directions so we gave up and used the motor for a little bit. 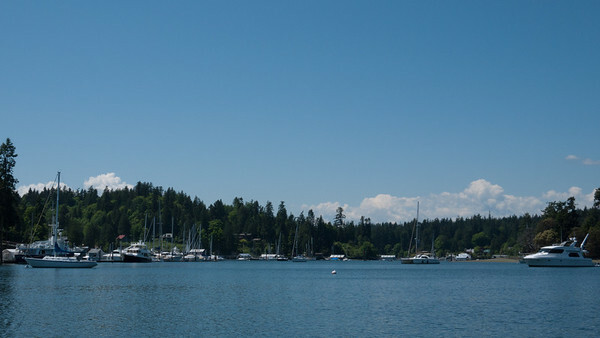 We sailed the rest of the way from Bremerton, through Rich Passage, up around Bainbridge Island, and back to the locks. From Eagle Harbor on Bainbridge Island back to the locks was one long leg with the wind across our beam and no needs to trim the sails. It was very pleasant, and we saw a few large groups of harbor seals too! Just as we approached Seattle the sky turned blue and we had a warm and easy motor back through the locks and to our berth. This isn’t an actual GPS track, but I made a rough map of our route on gmap-pedometer. The foredeck of the boat makes a nice place to be lazy. Coming through Agate Passage. We were going wing and wing (meaning jib on one side, main on the other, with the wind behind us), as were most of the other boats behind us. Wind was light, so we made slow but steady progress against the 1.5 knot current. There was a strong current coming out of Rich Passage as we passed by it on Saturday night. The smart boat sailed up the side, away from the current. The other was driving up the middle. 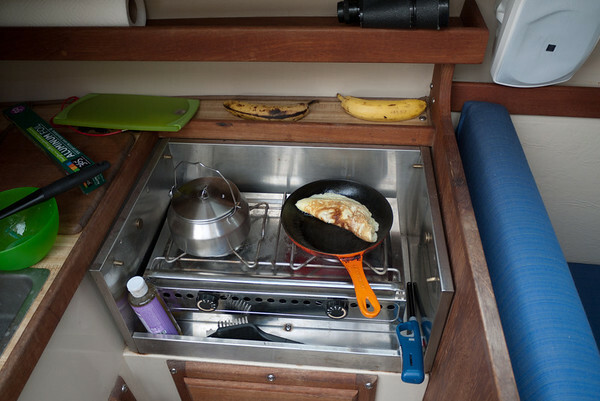 Any kitchen that allows me to make an omelette and coffee feels like home. Heading back towards Seattle. The skies and seas were a bit darker most of Sunday. The wind was nice though, and the ride home was pretty pleasant. Back in Seattle to our home port of Lake Union. 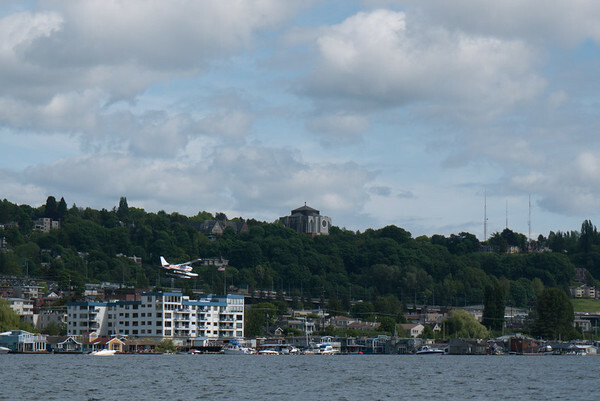 Seaplanes are constantly taking off and landing near us. I bought a new to me mountain bike. I wasn’t looking for one, but this came up on Craigslist and just called out to me. 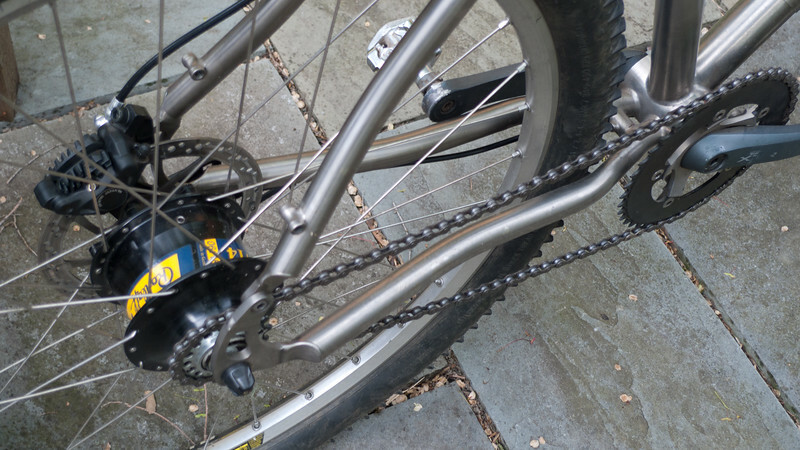 It is a S&S coupled titanium Seven Verve that was purpose designed for the Rohloff Speedhub. 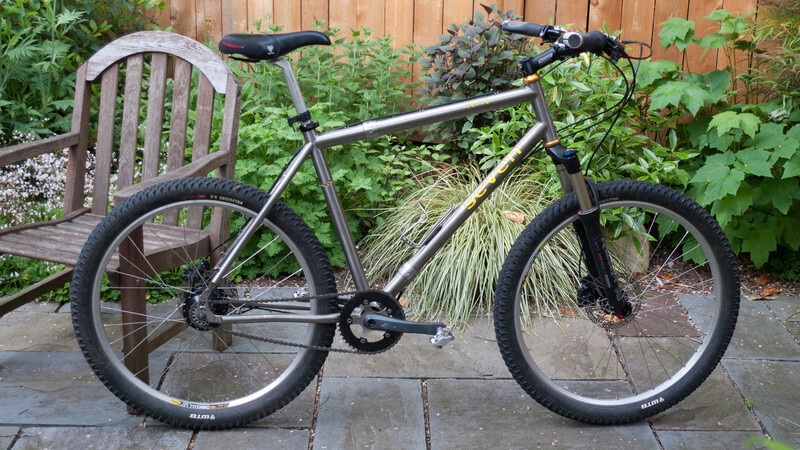 The seller was using it as a commuter/city bike, so it came with slick tires and a rigid carbon fork. I moved over the tires and suspension fork from my old mountain bike and got some new Shimano XT hydraulic disk brakes for it. My old mountain bike frame went to John Speare, it fits him a lot better than the Salsa Ala Carte that he was riding. 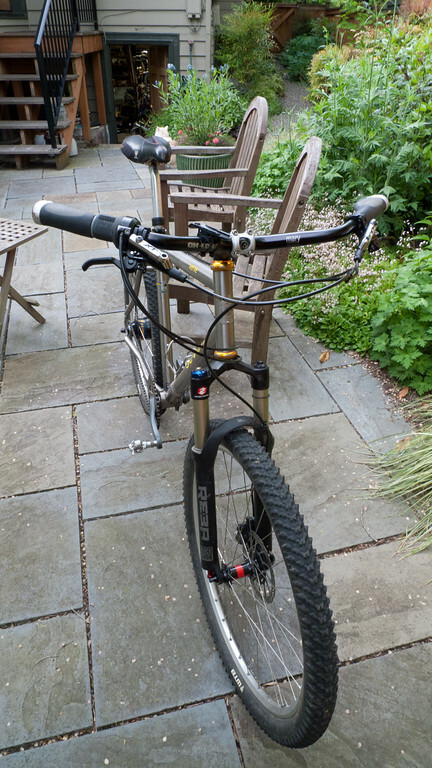 His Salsa is now my loaner MTB and has many of my spare parts on it. More on that bike later. I took the Seven out to Fort Ebey State Park with a few friends last weekend and had a blast. It’s a great riding bike. Here are a few photos of the bike, plus one cell phone photo that John took of me at Ebey. Head shot, with the Reba fork. I love that fork, it is very plush and easy to adjust. Congrats! I”ve always had a dream of getting a boat since spending many summers in Switzerland on my uncles” boats. 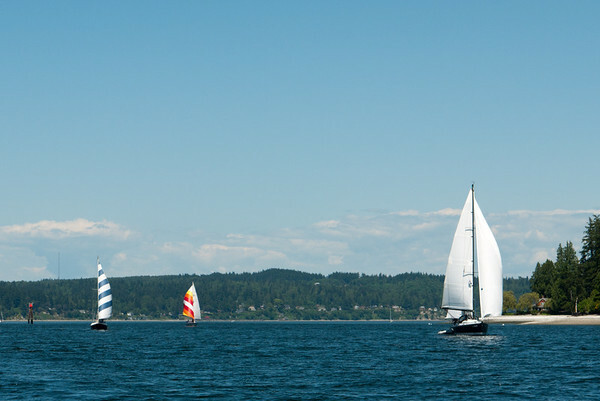 Doesn”t look like it will happen, but I”m always stoked to see sailboats on my travels.